There is every type of colored tennis balls available to suit aesthetic tastes, but the real choice is when deciding what type of tennis ball you need. There are several levels of balls, and individual types, at varying prices due to their quality and durability differences. The unusual ones include pressureless tennis balls and ones designed for either kids or people new to the sport of tennis who wish to learn slowly.Effective performance and the sustainability of the product are vital aspects to the selection of a good ball. After all, when you hit it right down the middle, you expect it to fly straight and true. You wouldn’t want a pressured ball to go flat on you in the midst of a game, so tennis balls must be reliable enough to not replacing too frequently either.Here we review five of the best tennis balls to see how they might suit your game. The Gamma Sports range of foam tennis balls is an alternative to rubber-based products. The primary intention behind both the Quick Kids 36 and the Revolution models is that they are targeting children keen to play tennis. It is far easier for younger players to repeatedly hit a foam-type ball without tiring out than a rubber one. Both types of ball are larger than regular tennis balls and meet both the United States Tennis Association (USTA) and International Tennis Federation (ITF) stage 3 formats.Whether the child wishes to play to“Tennis 10” or “10 and Under”standards, or on a 36-foot tennis court, both the Quick Kids 36 and Revolution balls are suitable. The foam material has a two-toned appearance and form that intentionally makes it easier to learn how to apply spin to the ball during gameplay. The use of this material makes it easier for younger players to strike the ball and fire return shots back due to the 75% reduced velocity.A significant distinction with the Quick Kids 36 product is its design to bounce lower to the ground than the Revolution ball which bounces up noticeably higher. For pre-teens who are taller, the Revolution ball is no doubt playable, but with younger kids, the Quick Kids 36 product is a better fit for their reduced height. The coloring of the Quick Kids 36 product is either yellow with a red pattern or just has yellow coloring alone. For the Revolution balls, they use a yellow and red pattern. Both products initially show the Quick Kids or Revolution branding which will likely wear off during extended play. Therefore, it’s a good idea to keep each collection of balls separate if owning both product types to avoid mixing them up accidentally.Both products are available in sets of 12 or 60 balls, and sometimes as a smaller 3-pack too. Wilson is one of the tennis ball brands that has become synonymous with the sport. Indeed, the company has been supplying the US Open with their tennis balls for every championship from 1978 to the present day. It’s also the official brand of the Australian Open Grand Slam Championships and NCAA Tennis too. As such, it’s difficult to go wrong with a Wilson product given that stamp of approval.Their Championship Extra Duty ball is designed specifically for hard surfaces and supports longer play that runs into multiple sets. It is both ITF and USTA approved too.The product uses Wilson’s blended Dura-Weave wool felt on the exterior of the ball with the goal of improving game performance and the overall endurance of the product. The felt won’t wear off quickly preventing the completion of a match and its use in a follow-up one. The core compound also gets special treatment to ensure improved play through perfect balance and durability. The Championship rated ball means it is in the mid-tier. It sits above the Recreation type of tennis ball for single matches, but it also lacks the Professional class quality level. For competitive games between friends, this ball is well suited.The Extra Duty ball is also lighter than Professional ones like US Open balls. For players with a lighter swing and female players, the product is likely to be pleasing for this reason. 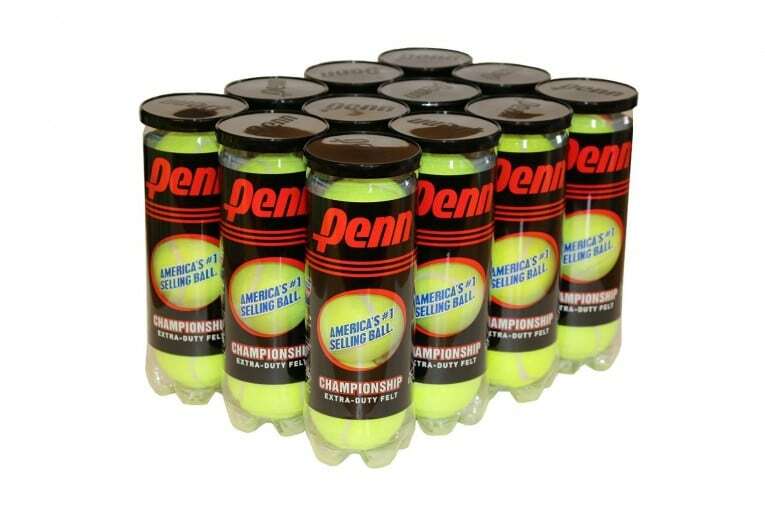 However, for male players who are used to the heavier Pro tennis balls, using this product takes some adjustment to avoid over-hitting it.This is one of the best tennis balls for regular players on hard surface courts.The size 24 balls come in a 4-ball package; one can play with three balls or 4 cans containing 12 balls. These Penn Championship tennis balls compete directly with similar products like the Wilson Championship product reviewed above. These are cheap tennis balls, but they still offer good value to players who play on hard court surfaces and need a fireball.The exterior of each ball uses a wool fibrous material that has an interlocking weave for improved longevity under heavy ball striking and hard court surfaces. A natural rubber ensures balance with a predictable response and cuts down on the amount of shock that the ball holds after each hard strike. The elastic seams run deep within the structure of each ball to avoid early cracking which would make the ball unusable. There is a black inked Penn branding across each ball. Each can of balls shares the same numbering to make your ball easier to find when it strays onto a neighboring court. These Extra Duty balls from Penn are more affordable than Pro Penn tennis balls and likely to hold up very well on harder court surfaces too. Designed to be more durable, you notice that right away when using them. They won’t outperform the likes of US Open, or Pro Penn balls, but their performance delivers excellent value for money nonetheless.The product is available in 36 ballparks spread across 12 cans. The can must be kept sealed after removing a ball to ensure the other balls don’t pop and lose their sealing. It comes with or without the inclusion of an In Prime Time-branded magnet for the refrigerator or car. There is a little bit of confusion about this magnet. It is unconnected to the tennis balls themselves and is merely a trinket to visibly share an interest in the game. The Penn Championship Regular Duty ball holds the distinction of being the No. 1 product of American tennis players. It is also the one used in the USTA League, so that’s a good reference too.The product is intended for use on clay and soft surfaces, not hard courts which would damage it. The ball plays equally well on indoor and outdoor courts.It is made using wool that has an interlocking weave to avoid wearing through too quickly. The rubber is natural to ensure a dependable performance from every ball in the can. The natural rubber core mitigates the shock from hard strikes. To avoid cracking open, the seams of each ball run deep with elastic sealant. The Regular Duty nature of this product means it is not intended for hard surfaces. The hard-hitting player may also find this product won’t hold up as well as heavy duty balls that they’ve used before in their gameplay. One significant advantage to playing with regular duty ball is that it takes less strength to strike the ball hard enough to hit it back across the net. For anyone with reduced arm strength or who suffers from occasional Tennis elbow pain problems, they’ll be pleased with the reduction (or elimination) of pain after completing several sets using these balls. As a side note, there is a tennis elbow padded available that reduces physical issues relating to this problem.The durability of these balls is reasonable. Indeed, they’re usable for several matches, but beyond that, they’ll need replacing. 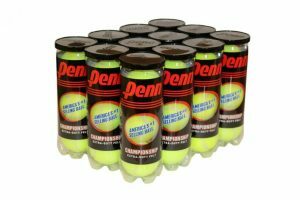 For play on soft or clay surface courts, these offer fair value.These Penn balls are available in packs of 12. When it comes to premium performance tennis balls, the best tennis balls are perhaps the Wilson US Open ones. Wilson branded balls are used in the US Open, Fed Cup, David Cup, and the Australian Open too. In the case of the US Open, it’s been the official ball for nearly 40 years, and annually over 60,000 balls get used in the competition. The product naturally is approved by both the USTA and ITF for aggressive competition. The Wilson US Open Extra Duty product is made especially for hard court surfaces, so they hold up on any kind of surface (clay, grass, etc. ).The ball is designed to play well on higher altitude courts up to an elevation of 3,000 feet. It weighs identically to the US Open Regular Duty product. Each ball has a Tex Tech wool felt material made byTex Tech Industriescustomized to the specifications of their client. The company has been producing felt for tennis balls for decades. As far back as the 1980s, they brought to market their unwoven felt that was more durable than other alternatives.The Extra Duty product is one of the most durable ones for fast-paced play and handling harder courts without the balls coming apart at the seams. The consistent performance is one of the hallmarks of this ball.The US Open Extra Duty product is available in 4 cans with three balls to each can 12 balls. The Professional Class balls are the highest specification. These products offer excellent responsiveness, predictability during sets, and represent the best tennis ball that each manufacturer can produce. 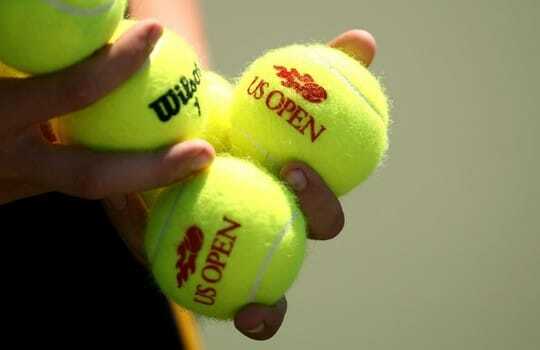 Professional class balls are the ones used at the US Open, Wimbledon, Australian Open, and other major tennis tournaments during any calendar year. 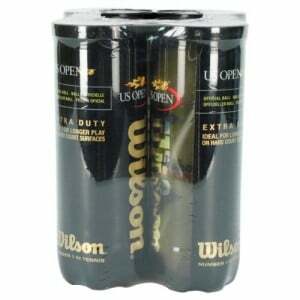 An example of one of these products is the Wilson US Open Regular Duty ball. These class of product is the most expensive to use.The Championship class balls are the next level down. Local tennis league matches, team games, and school competitions are all played using the Championship level products from major manufacturers like Wilson, Penn, Dunlop, etc. In many cases, the manufacturer will name their ball clearly such as Wilson Championship Heavy Duty tennis ball. The naming confirms the brand, that it’s Championship class, and that it’s a Heavy Duty type (suitable for hard court surfaces). Regular Duty balls are intended for both indoor courts and outside clay surfaces only. They won’t hold up well on harder surfaces and will lack durability. Hard court surfaces suit Extra Duty balls designed for them. For instance, the Extra Duty balls are the type used in the US Open competitions. Tennis balls that specify High Altitude perform well even in environments where the air is thinner such as courts situated at a higher altitude. Balls are sometimes pressurized, so the different air pressure would ordinarily change how the balls would perform during a game. Tennis balls marketed as Extra Durability have a dual inner core that works overtime to stop air from escaping the ball. A common problem is opening up the ball can and not closing it shortly after that. When doing so, the pressurized air from the tennis balls can escape leaving them flat and unplayable. An extra durability ball keeps their bouncy responsiveness usually twice the amount of time that a regular ball does. If you are starting to play tennis then recreational balls good for practice through tennis ball machine.Tennis balls for beginners fall into two categories: ones suitable for adults and others appropriate for kids. The products for teenagers and pre-teens are particularly useful to help get them started with their first game of tennis. For adults who aren’t afraid of being accidentally hit by a ball that they didn’t get out of the way of fast enough, then a Regular Duty or Heavy Duty Recreation tennis ball (depending on their court requirements) will suit them perfectly. The practice will feel closer to the real thing whether playing with either a Championship or Professional class ball. With adults who are either squeamish about getting hit by a ball or need the confidence builder of an easier ball, then the foam-based ones typically used by children (see below) or the transitional balls like the Gamma Sports Kids Training Transitional ball isn’t a good idea. Companies like Gamma Sports make foam balls instead of the usual rubber-based ones. The advantage of these is that they’re considerably lighter than regular tennis balls and often larger too which make them easier for younger players to return a serve or continue a rally. Quite often, the foam balls also travel up to 75% slower than regular tennis balls which make it easier for people learning tennis to practice their swing technical. With the improvement in their game, later a new player can practice with regular-sized, rubber-based balls that travel faster. 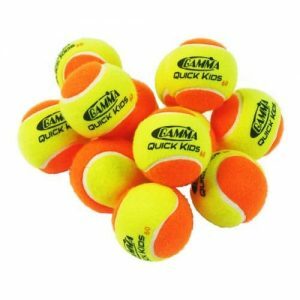 For players under 8, some foam balls are designed to bounce lower making it easier to hit.The Gamma Quick Kids 36 (reviewed earlier in this guide) is a good starting point. It is a foam ball in attractive colors that is larger and plays far slower with a lower bounce than regular tennis balls. A body hit is unlikely to create much theatrics by the child who probably won’t feel it and be able to play on. Once comfortable with the game, they can happily move through the Gamma range. The Gamma Quick Kids Tennis Balls are probably next, and then the Gamma Sports Kids Training transitional balls are the follow-up step before switching to rubber-based tennis balls.Regarding durability, foam-based balls will wear out over time. The Gamma transitional balls won’t last more than a single match because the felt and lining just won’t hold up. They’re inexpensive compared to regular brands, so there’s a trade-off there. A quality tennis ball is the entry way into the exciting world of tennis. Whether playing for fun, to socialize around a common sport, competitively, or only to improve health and fitness, both the top tennis racquet and the tennis ball are the sporting passport into this new world.Many friends and couples take to the court on the weekend to practice their back swing, overhead return or smash. Friendly conversation often flows smoothly during a match and leads to new socializing opportunities after the competition too. Anyone looking to get fitter and drop a few pounds by playing tennis rather than hitting the gym will find they exert themselves far more than they ever imagined during a game. The semi-constant running, dipping down to return a low ball, and stretching during a serve help improve fitness, reduce heart rate, strengthens muscles and improves bone density (particularly in older people), lowers body fat, improves hand/eye coordination, and reaction times. When bringing your set of tennis balls to the court to use in a friendly match, be sure not to let the side down. A new set of unopened balls still in the can is better than using a can previously open where air may have escaped from the balls already. Bring along more than one supply of balls to avoid a bad batch. If you’re uncertain whether you’llbe playing on a hard or soft court, bring multiple types of balls with you. It is often a good idea to discuss types of balls with your future opponent or the group of friends who are getting together later for a friendly game. Some ardent players won’t be happy to learn you’re planning to play with Recreation ones and will expect Championship class only. With other people playing a friendly game, they probably will be happy with Practice ones. Avoid disappointment by asking what is preferred.In the case of foam balls, only a group of tennis newbies who’ve agreed to use foam balls on the court will be happy to do so. One definitely should check which players are okay and those who are not fine playing with foam balls before only bringing this type to the court. Choosing the right tennis balls is not as easy as one might think. The right brand is important. The appropriate class of ball for the game about to be played matters more to some players than others. Also, the ball type is critical to the ensure durability of the felt on the outside. 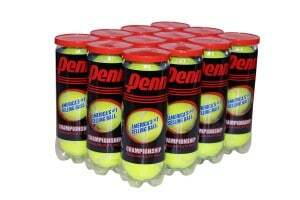 Be sure to purchase the best tennis balls for your game.